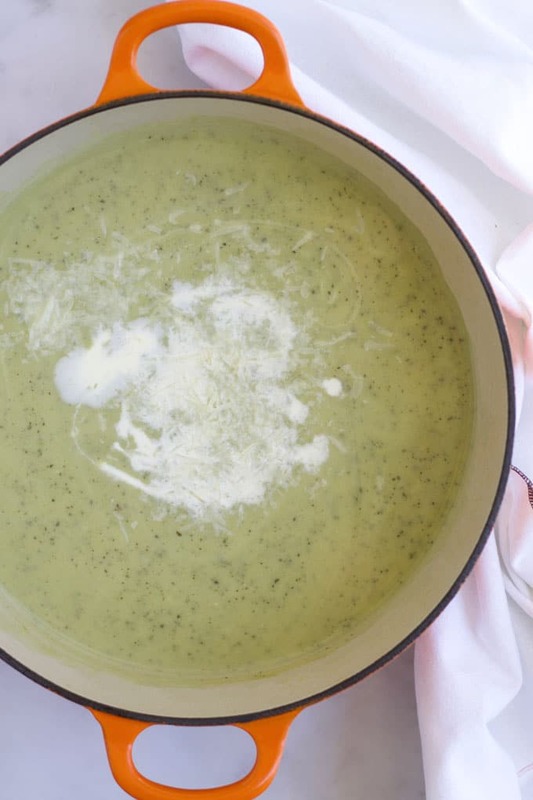 This delicious Courgette Soup (Zucchini Soup) is smooth and creamy and can even win over courgette haters! I never liked courgettes as a kid, I think it was mainly to do with the texture. Despite loathing them, I did love this Courgette Soup. Most of the time when I visited my Gran and Grandad I was served a big bowl of this soup. Their neighbour was always giving my Gran bags full of courgettes and she would use them to cook and freeze large batches of this soup. Even though I knew the soup was made with courgettes I still happily ate it. This is why I am always telling my kids that just because you don’t like a food prepared one way doesn’t mean you won’t like it prepared other ways. I first published this post in March 2014. I have updated it with new photos and more recipe information. 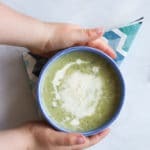 Is Courgette Soup Good for You? Soup is fantastic for getting more veggies into a kids diet. Both my kids love soup and will happily eat bowl after bowl of it. We want our kids to eat a range of different vegetables for maximum nutrition, soup is one way that we can do that. 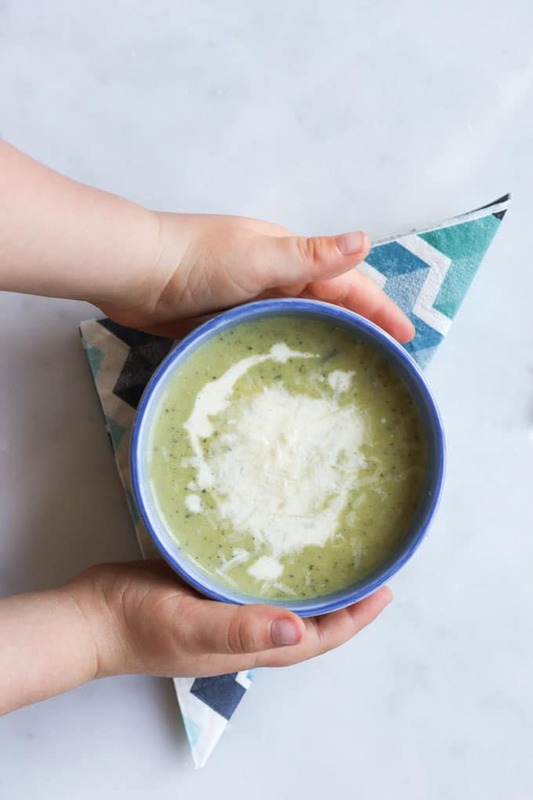 Courgettes are rich in minerals and vitamins that include potassium, phosphorus, magnesium, calcium and vitamin C. Its peel (which is blitzed into the soup) is a good source of dietary fibre which will help if your little one is suffering from constipation. What I love about this soup is how thick and creamy it is, even before you add cream. 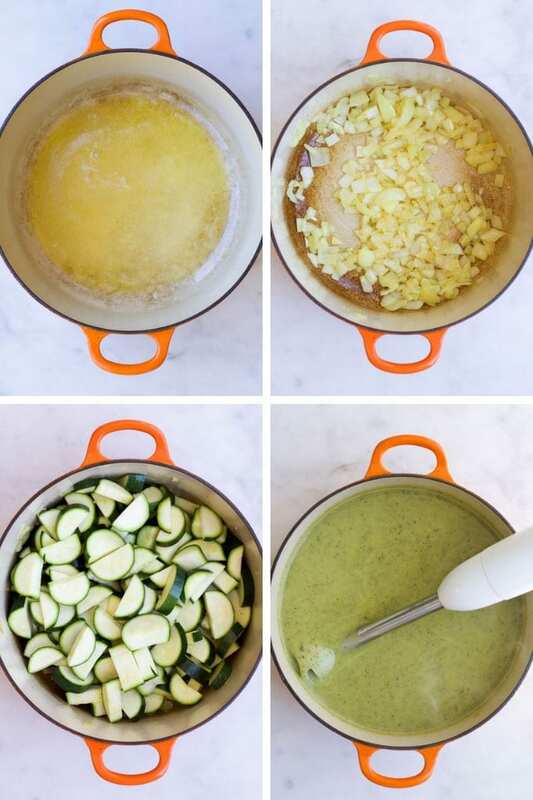 The courgettes blend together to make the soup smooth and silky in texture. Therefore, if you want to make this soup dairy free you can easily skip the cream altogether and replace the butter with some olive oil. This soup freezes really well. Allow to cool down, transfer to freezable containers, with good lids, and freeze for up to 3 months. A deliciously smooth and creamy soup. Add the stock and simmer for 25 mins, until the courgettes are very soft. Using a stick blender, whizz until smooth. Add the cream (optional) and stir through. Delicious served with some freshly grated parmesan. To make dairy free you can replace the butter with olive oil. You can miss out the cream, the soup is actually quite creamy without the extra cream. Use homemade stock or low sodium stock if serving to baby / young child. You can also replace some of the stock with water to reduce sodium levels. This soup was delicious, my 2 yr old has adairy intolerance so I removed a bowl for him before adding the cream for the rest of the family. Made it today. First time using courgette other than grated in pasta sauce. Was tasty, I’d add potato for thicker texture next time. Otherwise lovely will definitely make it again! Lovely recipe. I don’t add cream and I have just made it for the 3rd time.